Have you struggled with losing weight in the past? Do you spend far too much time thinking about food or your weight? How many times have you said ‘the diet starts Monday’? Perhaps you’ve tried numerous diets and are STILL trying to lose weight. Do you beat yourself up for not having the ‘willpower’ to stick to a diet? Or maybe you feel you’ll never be your ideal, healthy weight? If you are like many dieters, chances are you’ve been on and off diets for years. Perhaps you have tried the latest media-hyped miracle diets, joined a weight loss group or just stuck to calorie counting, yet ‘nothing works’. Maybe you have successfully lost weight, only for it to have crept back on again. Few people actually manage to lose weight with ‘diets’ and keep it off. Did you know less than 10 per cent of ‘traditional’ dieters manage to lose weight and keep it off?¹ Research indicates at least 1/3 of dieters actually GAIN MORE weight long-term than people who don’t diet². Traditional ‘diets’ do not work. If losing weight simply required a calorie controlled diet and willpower, you wouldn’t need our help. Hypnotherapy is an effective approach to weight loss and health because it addresses the underlying causes of overeating. Imagine eating the right diet for you, without snacking or overindulging, and enjoy sticking to it. Advanced hypnotherapy can make it happen. Whatever your current weight, you could transform your relationship with food permanently with your full commitment to your health, and our unique advanced weight loss hypnosis programme. Just eat less and exercise more?!? Probably one of the most frustrating, irritating and easy phrases someone without a weight problem can say. If it really was that easy, we would all do it, and the multi-million-pound diet industry would be out of business. Putting the ‘eat less and do more’ theory into practice is an entirely different matter! Successful long-term weight loss it not about excessive dieting and physical exertion. It is about changing your lifestyle and eating habits. Dieters are more than aware that excess food is stored as fat, and many slimmers have an incredible, encyclopedic, knowledge about, calories, fat, diet theories and exercise routines. They may have tried numerous diets, but are still trying to lose weight. Diet choice and exercise does, of course, affect how much you weigh. The simple formula of eating less and burning more energy will result in weight loss. However, diets and exercise programmes do not address the real reasons for overeating. After all, most of us know that eating too much results in weight gain. Doing it is the tricky part. The secret to losing weight and staying slim starts with understanding why people put on weight – and it is not just simply a case of eating too much! We all know that ‘diets don’t work’ but what is the answer? Restrictive, faddy diets and punishing exercise routines don’t work long-term because they don’t address the real cause of excess weight – why people overeat. People eat for 3 reasons, but the naturally slim only eat for one. Food is fuel for the body, and the body has an inbuilt mechanism that tells us what we should be eating; when we’re hungry and when we’re full. A naturally slim person eats only for their physical satisfaction – i.e. what their body needs. They instinctively seek out a healthy, nutritious diet and, although they may consume some ‘unhealthy’ foods, will overall choose a balanced diet. Natural slim people eat for physical satisfaction only. An overweight person not only satisfies their physical needs for food, but emotional needs too. This ‘extra’ satisfaction manifests as ‘extra’ pounds on the scales. The other element that also impacts on weight gain concerns what you eat, rather than how much. Chemical imbalances in the body caused by eating sugars, unhealthy fats, chemical and pesticide laden foods encourage the body to store fat. Most people don’t overeat because they are hungry – they do it for emotional reasons, which food can never properly satisfy. The naturally slim and healthy person eats for their physical satisfaction; i.e. the fuel their body needs to function correctly. They eat when they are hungry, chew their food properly to maximise nutritional intake and digestion and stops when they are full up. We all have that inbuilt program for being naturally slim. However, if information is programmed incorrectly or ‘mind viruses’ are created, our natural ability sustain a healthy eating pattern is disrupted. The mind works like a computer – you get what you program it for. We have many different ‘programs’ running in the mind, including language, walking, reading, relationships and, of course, eating. Many of these programs are formed during childhood when our minds are like sponges, soaking in all the information from the world around us – from stories, our parents, family, friends, teachers, TV, society and other influences. Links between food and emotion are built from birth. From birth, most people are held and fed by their mother, feeling warm, loved, comfortable and safe. From an early age, we are taught to associate particular foods with good feelings. The mind links feelings, often with particular foods, such as sweets, chocolates or crisps, and the pattern is set. The subconscious mind receives a benefit from these feelings and will seek out ways to recreate them. And as adults, emotional eaters will satisfy these emotional needs with extra food. by repetition, when we hear, experience or practice the same thing repeatedly (habit). For example, many people can remember being rewarded as a child with ‘treat food’ for ‘good behaviour’. Maybe you were given treats to make you feel better if you were hurt, upset or to keep you quiet, whilst your parents were busy. Or perhaps you were taught to clear your plate with the reward of desert, or guilt about the “starving children in Africa”. Our subconscious inner mind is designed to keep hold of our behaviours, attitudes and thought patterns. Normally these mind programmes are there for our survival. Imagine driving a car at 70 mph on the motorway and suddenly forgetting how to drive. It would be very dangerous. Willpower works with our conscious mind. It works by practising something many times, until eventually our subconscious takes it on board and accepts it. The trouble with willpower is that it’s not consistent, and when it weakens, you give up. 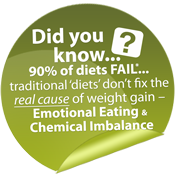 This is why many people find traditional dieting so difficult! There is another very important element that can impact on gaining weight and it concerns what you eat, rather than how much. Chemical imbalance can impact on gaining weight and cravings, often for unhealthy foods. Essentially we need to eat the right food that supports our individual needs, rather than substances which can encourage cravings, bloating, fat storage and lethargy, which sabotage our health. There are two main reasons why your body may experience chemical imbalance. Our own individual chemical make-up including food intolerances and hormonal balance, can affect our weight. If you are ingesting substances that are your body is rejecting, you may experience cravings (often to the foods we are allergic/intolerant to), bloating and lethargy. Often these more ‘physical’ issues give way to excuses as to why someone cannot lose weight, e.g. “I have a slow metabolism”, “it’s genetic”, “I have a thyroid problem” etc. Although is true that losing weight can be more difficult if you have a food intolerance(s) and/or hormonal imbalance, the good news is that “physical” issues can be both identified and treated. Many of the ‘foods’ we eat are not real food, but a mishmash of chemicals, pesticides and non-food substances –and this can create havoc if you’re trying to lose weight. Overfed, undernourished; ‘Convenience’ and ‘junk food’ is as far from natural food as possible. Quite simply they are not food and the body does not know what to do with it. By feeding your body with empty calories from nutrition-less ‘junk food’, it doesn’t get the required nutrition. The body will naturally seek out the nutrition it needs, and encourage you to eat again. Sugar cravings and insulin production: sugar and heavily processed foods give you a quick burst of sugary energy, followed by a release of insulin as your body works hard to re-balance your energy levels. As your body is busy restoring your blood sugar to normal, energy levels dip and you crave another quick fix. Poison and the Pesticide Paunch: The chemicals and pesticides in many “foods” (and food packaging), including processed foods, non-organic fruit and vegetables, are a poison to the body. These chemicals disrupt our hormonal systems and metabolism, and many researchers believe they lead to weight gain. These poisons lurk in food, food packaging, cleaning agents and beauty products, all of which can upset your body’s natural balance. Mind altering substances: Sugar, transfats and other chemicals in junk food ‘trick’ our minds into thinking we are still hungry. By ensuring you eat natural, preferably organic, ‘real food’, you not only improve your health but increase your chances of becoming slim. Food may take a little longer to prepare, but surely your health is worth the extra effort? And seriously, how long does it take to peel a banana or open a bag of nuts if you’re in a hurry? The power of hypnotherapy has been proven in numerous research studies as the most effective long-term weight loss treatment. This is because weight loss hypnotherapy works with your inner, subconscious mind, where emotions, attitudes towards food and eating habits are stored. Naturally-slim people enjoy their food, eat when they are hungry and stop when they are full. They do not feel deprived and they tend to have more energy as they are not wasting it by thinking about food / losing weight or feeling guilty. Our tried and tested weight loss programmes are designed to help you to think, feel and behave as a naturally slim person. We offer two core weight loss programmes; the Virtual Gastric Band and our advanced structured hypnotherapy programme. The Virtual Gastric Band is suitable for the majority of people and has been tried and tested for over 6 years. This remarkable weight loss programme demonstrated a 95% success rate in initial trials and is currently undergoing clinical trials. The VGB is a non-surgical hypnosis based technique which convinces your mind to be satisfied on much smaller portions of food. It gives very safe and predictable results and reset your changes how you think about food. The hypnotherapy retrains your brain that your stomach is full after a certain amount of food, and therefore there is no need to eat more. This 4-week programme also tackles the psychological issues associated with poor habits around food. It is most definitely NOT a diet – we know that diets only work in the short term. The Virtual Gastric Band allows you to eat what you want, but in much smaller quantities. 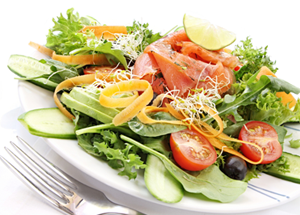 It is NOT a diet because you can eat what you want, but in much smaller quantities…. therefore you don’t feel deprived, miserable or hungry, which are the most common issues why ‘traditional’ diets fail. For some clients, particular those with a long-standing issue of eating disorders or a life-long weight issue, deeper work can be required. In these cases, we recommend our advanced structured hypnotherapy to addresses deeper rooted emotional cause(s) of overeating. This is a more intense programme, which can be used in alongside the Virtual Gastric Band. Often people know that they shouldn’t be eating something, but something or “part” inside them makes them go ahead and do it anyway. With hypnosis, that satisfaction can be transferred to something healthier and more beneficial to you. The next step is to get to the root of the problem. Using age regression, events can be revisited with ‘adult eyes’ and ‘fixed’ using specialist techniques. By addressing the root cause of the overeating, remarkable and permanent change can be made within just a few sessions. Finally, suggestion therapy can be applied to relearn listening to your body’s natural hunger signals, responding appropriately and encouraging you to eat a healthier, balanced, more natural diet. An effective weight loss programme is the combination of eating the right amount of food that’s right for your body. And for some clients, we find combining techniques to address both emotional eating and chemical imbalances, created by foods that your body does not agree with, is necessary. Advanced hypnotherapy addresses emotional eating and our VEGA screening is used to identify your unique combination of foods / substances to avoid without months (or even years) of testing. This means you’ll know which foods / substances to avoid to support your weight loss journey and avoid physical cravings. At The London Hypnotherapy Partnership, we only offer individual treatments. Success rates for group programmes are considerably lower – 20-25%, depending on which research you read – for a number of different reasons. Weight loss is an individual issue: The reasons for someone overeating or emotional eating will vary from person to person. A one size fits all approach cannot possibly deal with each individual’s very individual needs and motivations. Comfort and concentration: it can be very difficult to relax and fully concentrate in a room of strangers, for example, someone might be snoring or coughing, and you miss the vital information you need. Sabotage and lack of support: in any group situation different people will have different conscious and subconscious agendas. Participants who don’t believe or really intend to lose weight can sabotage your success with negative comments, or even encouragement to overeat! ‘Friends’: many people join weight loss groups with ‘friends’. Beware! Bringing your friends can mean sabotage is even more likely. Recent research surveying over 10,000 adults, indicated a third of women are secretly jealous of friends who lose weight, with a sixth actively wishing their friends were fatter than them. (“Drop a dress size… and a few friends: How weight loss jealousy wrecks women’s friendships”, Daily Mail, 28th December 2011) Support can be very helpful, but you need to be carefully in choosing the right support. Group therapy is a risk and can be a waste of money, time and effort. Giving you the best chance to succeed is our priority; therefore, we only offer individual therapy. Can you really succeed this time round? When you have a lot of weight to lose, it can seem like an almost impossible task, particularly if you’ve spent years struggling with your weight. Just as putting on weight takes time – it takes many months or even years of poor eating habits to gain weight – so does losing weight. However, no matter what you currently weight, with the right mindset that leads to healthy eating habits, the correct nutrition and patience, you WILL LOSE WEIGHT, KEEP IT OFF and become HEALTHIER. 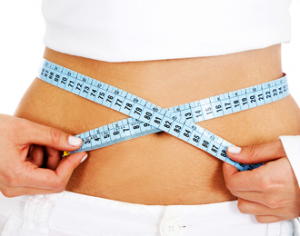 “I only have a few pounds to lose… is weight loss hypnotherapy suitable for me? Yes. Whether you have 7lbs or 7 stone to lose, hypnosis can help free you from emotional eating patterns that cause weight gain. If you are spending your valuable time and energy thinking about food, your weight or dieting rather than getting on with your life, hypnotherapy will help. Weight loss hypnotherapy is designed to tackle the underlying subconscious reasons for overeating, and reprogram your mind to think, feel and behave like a naturally slim person. Hypnosis is not a hit and miss success – it doesn’t matter how much weight you need to lose, how many times you’ve dieted, how old you are or whether or not you have a pre-existing medical condition. Numerous research studies demonstrate that the regression and direct hypnosis techniques we use produce the highest success rates, and with over 20 year’s success in the specific techniques and protocols we use, you can be sure of our commitment to providing you the very best therapy. Our tried and tested weight loss hypnotherapy programme is not a temporary fix – with your commitment and full participation, it could be permanent. Do not be fooled into thinking that there is a ‘fat gene’ or condition preventing your weight loss, despite what you may read in the media. Even the most genetically disadvantaged person can lose weight if they apply the principals of eating less, eating the correct nutrition and burning energy more effectively. Across a whole population of people, there will always be a certain percentage with medical conditions associated with weight gain, such as underactive thyroid, Cushing’s syndrome or, Polycystic Ovary Syndrome (PCOS) and hormonal disorders. Many of these conditions are aggravated or even created by eating “foods”, and we can help you identify and desensitise you to allergens and / or intolerances. It is also true that in times of famine, the whole population starves regardless of their genetic make-up. Moreover, animals in the wild do not experience these problems — they eat for survival and select natural foods. Therefore, it is simply not true people cannot lose weight. Hypnosis has been used for over 200 years in the medical setting, including painless surgery. In addition to mindset changes around food, hypnosis can also be used to help improve medical conditions, encouraging your body to work more efficiently. Advanced hypnotherapy helps you address any underlying causes and emotions causing you to overeat. Gastric band hypnosis is a ‘virtual surgery’, where you are convinced at a subconscious level that a gastric band operation has taken place. It is designed to help you with the physical aspects of weight loss, e.g. smaller stomach capacity. For many clients, it is an excellent treatment. It is a fantastic, safer and more cost-effective alternative to actual surgery, but for some clients, with deeper emotional eating issues, advanced hypnotherapy which treats trauma based issues. The most appropriate programme for you would be discussed at the consultation stage, before any therapy is booked. We offer two levels of gastric band program; standalone ‘Virtual Gastric Band Therapy’ and our ‘Advanced Gastric Band’ which is as part of an advanced age regression based program. Long-term weight loss has little to do with willpower. Willpower is ineffective for most people — and this was demonstrated in a large study of over 72,000 smokers, which found only 6 percent managed to quit for at least 12 months using willpower (New Scientist, Robert Matthews, Issue 1845, October 1992). Traditional diets and exercise programmes rely on willpower, and have a low success rates for long-term weight loss. Willpower as a method of behaviour change has a low success rate because it relies on conscious effort. Weight loss hypnotherapy works with the inner, subconscious mind, where emotions, attitudes towards food and eating habits are stored. With the correct techniques, the subconscious can be persuaded to change and reprogram your mind to help you think, feel and behave like a naturally slim person. Hypnotherapy does not require willpower, but it does require your commitment and full participation in the process. You cannot be made to do something you do not wish to do in hypnosis. If you are serious about losing weight, advanced hypnotherapy gives you, probably, the best chance of long-term success. Hypnotherapy is a two-way process between client and therapist, and almost anyone can go into hypnosis. If you are able and willing to follow a simple set of instructions, a good therapist with a good technique will be able put you into hypnosis. People who have difficulty following instructions, such as those with brain damage or a very low IQ are therefore unsuitable for hypnotherapy. This is like saying “I went to school, but didn’t pass my exams… therefore school doesn’t work”. The teaching standards, lesson content, your willingness to work in class and home study commitment all affect your chances of passing. Within any industry, such as dentists, doctors, builders etc, there are excellent, poor and mediocre practitioners, and hypnotherapy is no different. Plus as hypnotherapy is a collaborative process, client commitment can also affect outcomes. The quality of specific weight loss hypnotherapy techniques, the therapist and your commitment and willingness to complete in-between session ‘homework’ will all influence your results. Your success can be easy regardless of how much weight you have to lose, how many diets you’ve tried, how old or fit you are, you can free yourself from the diet trap forever. 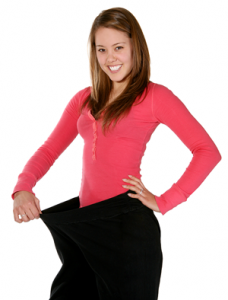 With our advanced weight loss hypnotherapy expertise and your full commitment, success can be yours. Lose weight for life. Call us today. If you are ready to stop dieting and become naturally slim, please do get in touch. Call Katie Glen or Jenny O’Kelly on 020 8712 5981 to book your complimentary 15-minute telephone consultation and discover how one of our weight loss hypnotherapy programmes could help you.